​Trinity faculty and staff is a group of extremely dedicated professionals that will guide your children through grammar school with compassion and Christian values. Please meet our staff! 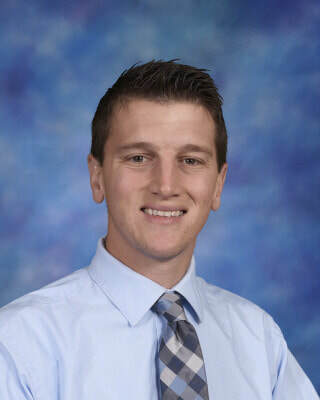 Mr. Andrew DeWitt graduated from Concordia University, River Forest with a Bachelor’s degree in Elementary Education and a Masters degree in Administration. He has been teaching since 2007 in grades three through eight and began his role as an administrator in 2015. Mr. DeWitt is currently the Principal. He also is the Jr. high track coach. When he is not at school, he fills his time with family, friends, and playing a variety of sports. ​Mr. 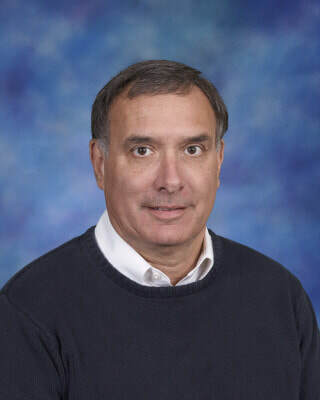 Neil Hammes graduated from Concordia University, River Forest with a Bachelor of Arts degree in Elementary Education, a Masters degree in curriculum and instruction as well as a Masters degree in Administration. He has been teaching since 1980 and has taught grades four through eight. He currently teaches a combined seventh and eighth grade class. He is the assistant principal; focusing on policy development. Mr. Hammes organizes the San Pablo food drive for the school, and leads Sunday morning Bible study. When not involved at church or school, he enjoys hiking, cycling, and reading. ​Mrs. Pam Winterroth graduated from Concordia University, River Forest with a Bachelor’s degree in Elementary Education with a specialization in English and art. 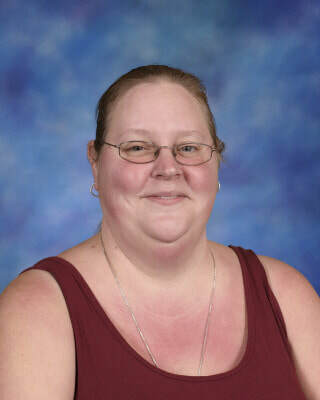 She has been teaching since 1996 and has taught in grades fifth through eighth; currently teaching sixth grade. Mrs. Winterroth directs the Christmas program and assists on the Lutheran Schools’ Week committee. She also sings in the praise team Sunday morning. When not involved in church or school, she enjoys watching her children play sports and reading. ​Ms. 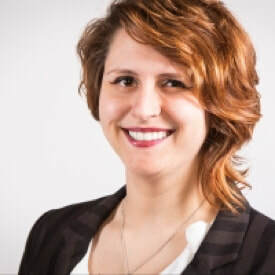 Allison Kumke graduated from Concordia University, Chicago with a Bachelor’s degree in Elementary and Middle Grades Education with a specialization in math and English. She has been teaching since 2018 and currently teaches fifth grade. Ms. Kumke assists coaching volleyball. When she is not teaching, she spends her time reading, baking/cooking, and playing volleyball. 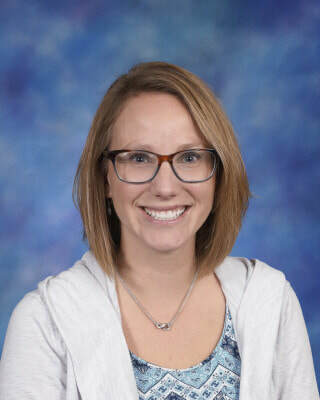 Mrs. Rebecca Hansen graduated from Concordia University, River Forest with a Bachelor’s degree in Elementary Education, a Masters degree in differentiated instruction, and a Masters degree in reading/literacy instruction from Capella University. 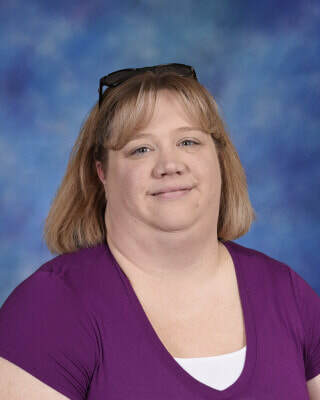 She has been teaching since 2004 and has taught in the Jr. high and elementary grade levels; currently teaching a combined third and fourth grade. 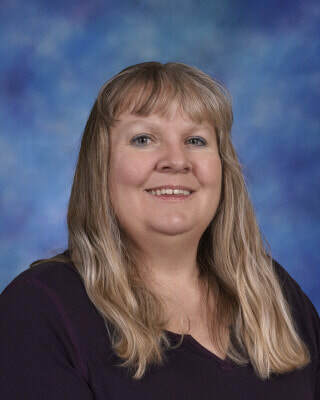 Mrs. Hansen’s extra duties include: yearbook editor, student council advisor, P.A.W.S. representative, and boys volleyball coach. When she is not teaching, she enjoys playing volleyball and reading. ​Ms. 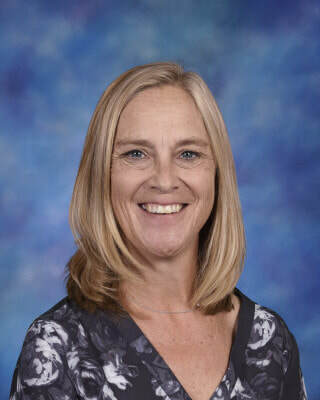 Lisa Haak graduated from Concordia University, Ann Arbor with a Bachelor’s degree in Elementary Education and a received her Masters degree in reading instruction from Concordia University, Chicago. She has been teaching since 1985 and has taught first, third, fourth grades and currently teaches second grade. Ms. Haak is the athletic director. She participates in the altar guild, church choir, handbells, and plays guitar for the Saturday worship service. When not at church or school, she enjoys watching sports and reading. ​Mrs. Debbie Hammes graduated from Concordia University, River Forest with a Bachelor of Arts degree in Elementary Education. She has been teaching since 1988 and has taught kindergarten and currently teaches first grade. 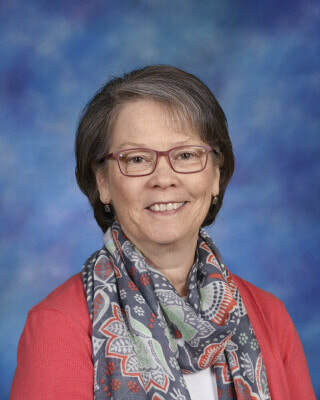 Mrs. Hammes’s extra responsibilities are Grandparents’ Day and public speaking contest committees, as well as chapel scheduling, baptismal birthdays, and assisting with the school library. When she is not teaching, Mrs. Hammes spends her time reading, crafting, and hiking. ​Mrs. 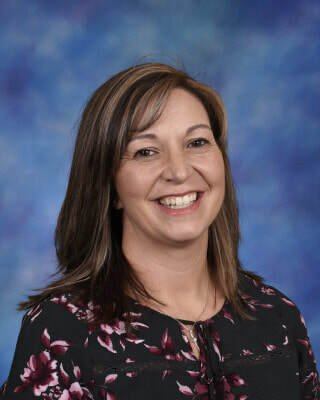 Kim Michaelsen graduated from Concordia University, River Forest with a Bachelor’s degree in Elementary Education with a concentration in curriculum instruction. She also received her Masters degree from Eastern Michigan University in Early Childhood Education. She has been teaching since 1985 with most of those years in kindergarten. Mrs. Michaelsen is on the Fine Arts Fair and Dinner-Dance Committees. She also sings in the praise team on Sunday morning. When Mrs. Michaelsen is not teaching, she enjoys walking. ​Mrs. Leann DeWitt graduated from Concordia University, Chicago with a Bachelor’s degree in Early Childhood Education. She has been teaching since 2010 and has taught in third grade, kindergarten, and currently teaches preschool. Mrs. DeWitt coaches cheerleading and assists on the Lutheran Schools’ Week committee. When she is not teaching, she likes spending time with family, friends, reading, and crafting with her Cricut. ​Mrs. Sharon Wendte graduated from the Conservatory of Music at the University of Missouri-Kansas City with Bachelor of Music Education degree. She has been teaching since 1983 and is currently teaching music in first through eighth grade. Mrs. Wendte also directs the Rejoice Choir (3-4 grade) and the Ablaze Singers (5-8 grade). When not teaching, she enjoys reading. Ms. Cook has worked with children for many years. She was a nanny for 6 years, before starting at Trinity. She loves working here at Trinity with all of the students. Every day is something new and fun. Ms. Erika Aluzas is a mother to a 17-year-old son named Alex. She attended Morton College in Cicero and received my Associates Degree in Office Management Technology. Ms. Aluzas also participated in the Early Reading First, IMPACT, and Literacy Rich Preschool Classroom Environments program at UIC Chicago. From there, she received an ECE Credential through the Gateways to Opportunity: Illinois Professional Development Program at Malcom X College. Ms. Aluzas worked for 6 years as a Preschool Aid at Pope John Paul II Catholic School in Brighton Park. She has been working at Trinity for 6 years and is currently the K.E.E.P. Director and preschool aid. She enjoys working with children and watching how much they learn and grow. Carol has worked with children for many years in different ways. She has been a baby-sitter, Vacation Bible School helper at her church, lunchroom supervisor for several schools in Burbank, and a Children's department worker at the Prairie Trails Public Library. She will complete her second year working at Trinity in the KEEP room this spring. She enjoys helping children to learn and play. ​Ms. Holloman graduated from the University of Valencia, Spain, and Erlangen, Germany where she studied Foreign Language Science and Cultures. While living in Europe, she taught Spanish, English, and German classes, from Kindergarten - High School. In 2014, she and her family moved to the Chicagoland area, and they love it here. Besides teaching at Trinity, Ms. Holloman works as a language tutor for college students and after-school enrichment programs. 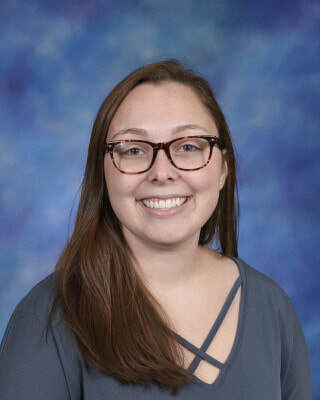 Señora (Mrs.) Dahms is a licensed elementary teacher and school counselor with middle school endorsements in Spanish, Language Arts, and Social Science. Both her Bachelors and Masters degrees are from Concordia University Chicago in River Forest where she also works part-time as a Career Counselor. Señora Dahms and her husband, Bill, have two sons who graduated from Trinity. Señora Dahms appreciates Trinity’s small size classes, invested parents, and the interactions within the Trinity community. She offers time after school for students who need additional assistance in learning Spanish. ​Ms. Lantz has lived in my hometown, Oak Lawn, Illinois all her life. She attended public schools until high school where she attended Marist High School. At Marist, Ms. Lantz had an experience with mural painting that still seen at the school. After high school, she attended Ripon College in Wisconsin and graduated with a major in studio art and minor in art history. It was during my time at Marist that Ms. Lantz was introduced to sculpting and sold my first piece. She did a volunteer mural project for the Girl Scout camp ground called Camp Evelyn. Currently, Ms. Lantz have painted two murals in the area. The first is in Palos and the 2nd is on-going at a private pool area, all while trying to receive her teaching certification. 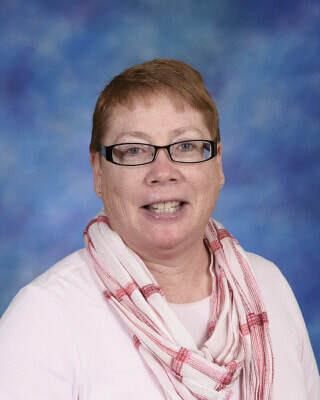 Mrs. Geaschel has taught at Trinity various years and grades since 1997, and last year moved into the Secretary position. She earned an Associates Degree from Rock Valley Community College and a Bachelor's Degree from NIU in education. Mrs. Geaschel is certified for K-9th grade in Illinois. Her son Jesse graduated from Trinity in 2013, and attended Trinity since Preschool. She is also married to Trinity's Senior Pastor, Bob Geaschel. ​Pastor Bob loves proclaiming the Good News of Jesus to both young and old alike. He is excited to see how God's love changes the lives of families and believes he is called to bring a message of hope to Burr Ridge and surrounding communities. 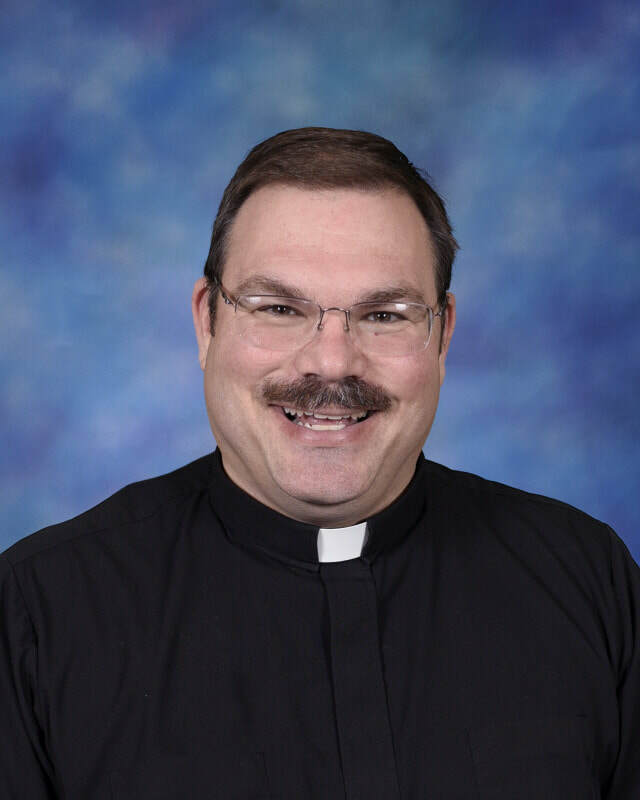 In addittion to his ministry at Trinity, he serves as Chaplain to Pleasantview Fire Department, Tri-State Fire Department, and Western Springs Post 10778 Veterans of Foriegn Wars. Pastor Bob has his M. Div. from Concordia Seminary in Saint Louis, and he is thankful for 25 years of marriage with Michele. They have one son and two dogs. ​Mr. Grady has been on staff at Trinity since 2003. He serves in Trinity School as our Seventh Grade Religion teacher and on occasion our Junior Varsity Basketball coach. 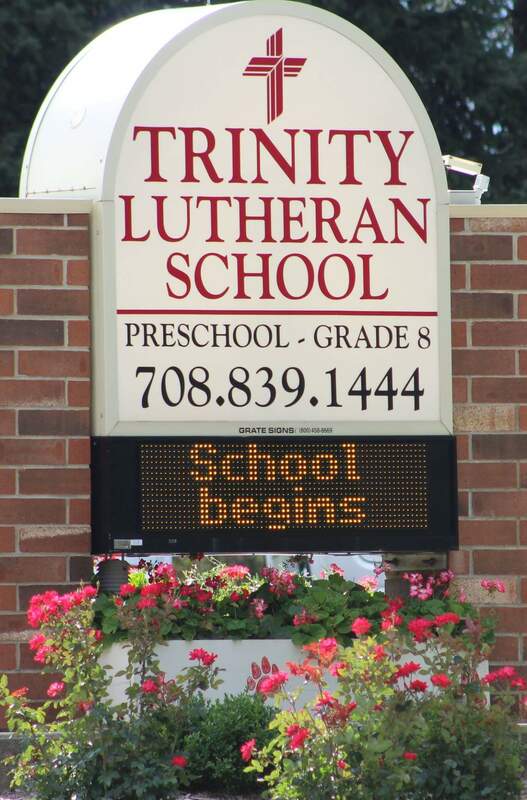 As the Director of Christian Education for Trinity Lutheran Church, he oversees the Board of Parish Education, the Board of Youth, and the Board of Family Life.